Why Are Dentures So Important To Oral Health? As a dental practice that offers cosmetic dentistry in Vancouver, Washington, we understand the inherent role that dentures play in oral health. When most people think of dentures they think of their grandparents when in reality dentures are a cosmetic dental tool that is used to correct oral deficiencies in people of all ages. 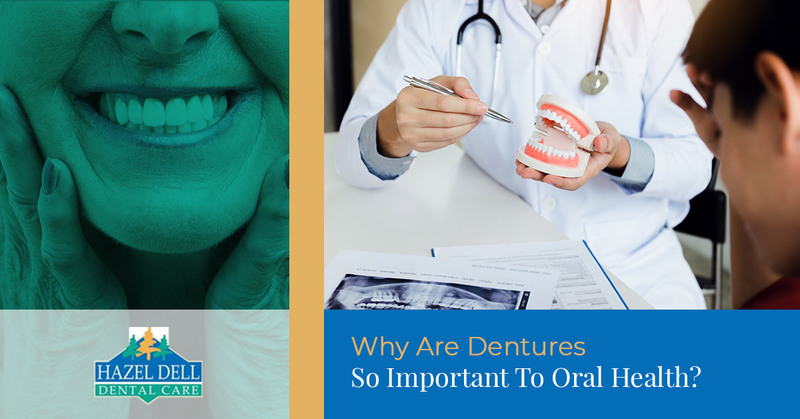 Dentures play a large role in oral health, but it is not commonly known the importance and impact that they have on individuals. In today’s blog, we will be discussing a few of the aspects of oral health that dentures might provide benefit to. Dentures are among one of the most popular tooth replacement options in modern dentistry. Dentures are used to replace some, or all, teeth that have been impacted by trauma, disease, or any other cause of tooth loss. While dentures are an excellent cosmetic dentistry tool, people are often more inclined to receive dental bridges or dental implants because of the risk of dentures slipping out during a social situation. All of that being said, for some people dentures are unavoidable. Luckily, dentures provide benefits to their wearer in three major ways. Improved Confidence – Try to imagine that you are missing some, or all, of your teeth. It might be a little embarrassing. You might avoid smiling so that people can’t see that your teeth are missing. That is no way to live. Dentures allow people to confidently smile once again — knowing that they have their smile back. Improved Ability To Eat – Having missing teeth places dietary restrictions on you. If you only have three teeth, eating an apple with confidence is pretty much off of the table. Eating a chewy steak is not only harder but more dangerous to the teeth that remain. Luckily, with cosmetic dentistry procedures like dentures, fixed bridges, and dental implants, dentists can help correct dietary restrictions that might have been experienced as a result of tooth loss. Improved Speech – Something that people don’t often realize until they lose teeth is that it can affect your ability to speak. If you were already self-conscious of your smile, a speech impediment is just another thing that is damaging to your confidence. With the addition of dental bridgework or dentures, people that are missing teeth can regain their ability to speak clearly. Improved Oral Health – When discussing missing teeth, it is extremely easy to think of issues of appearance and confidence before thinking about health considerations — but if there is any reason that you should consider dentures it is to maintain your oral health. When the gums are exposed to foods and drinks they become much more susceptible to damage, after all, they are not meant to be used for chewing. For more information on how dentures can increase your oral health, schedule an appointment with Dr. Kelstrom today. Missing Teeth? Come To Visit Us For A Solution! If you are missing teeth you might be suffering from social anxiety and degraded oral health. Luckily, confidence and health is just one call away. Schedule an appointment today with us at Hazel Dell Dental Care and take the first step towards a healthy and happy smile. We look forward to seeing you soon! Learn More About Dentures Today!